In response to the growing number of people turning to their mobile devices to search for medical information, Bolivar Medical Center has partnered with iTriage® – a free healthcare app and website that lets users learn more about a specific medical condition and find nearby healthcare providers. Two ER physicians created iTriage to help patients learn more about symptoms, diseases, medical procedures and medications, and then be directed to the closest medical provider anywhere in the country. 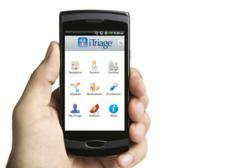 iTriage is available as a free download for iPhone® and Android™ phones, and is also accessible from any Internet-enabled device at http://www.iTriageHealth.com. Bolivar Medical Center is a 106-bed acute care facility accredited by Joint Commission on Accreditation of Health Care Organization. The medical staff consists of active members whose specialties include family practice, internal medicine, general surgery, ophthalmology, obstetrics/gynecology, urology, pediatric dentistry, radiology, pathology and nephrology. A podiatrist is on staff. For more information, please visit http://www.bolivarmedical.com.